In January I vowed not to buy any new fabrics for a year, but work my way through my stash while occasionally allowing myself to buy second hand fabric at charity shops or Tradera (Swedish eBay). Now that we are half way through the year, it is time for an update. Although I still find myself browsing online fabric stores when I am really bored and even went inside a brick-and-mortar shop once or twice – looking for notions of course – l managed to resist the urge to buy anything new. To be honest, nothing really appealed to me, but if I had come across a good bargain I might very well have given in. I am not that disciplined! 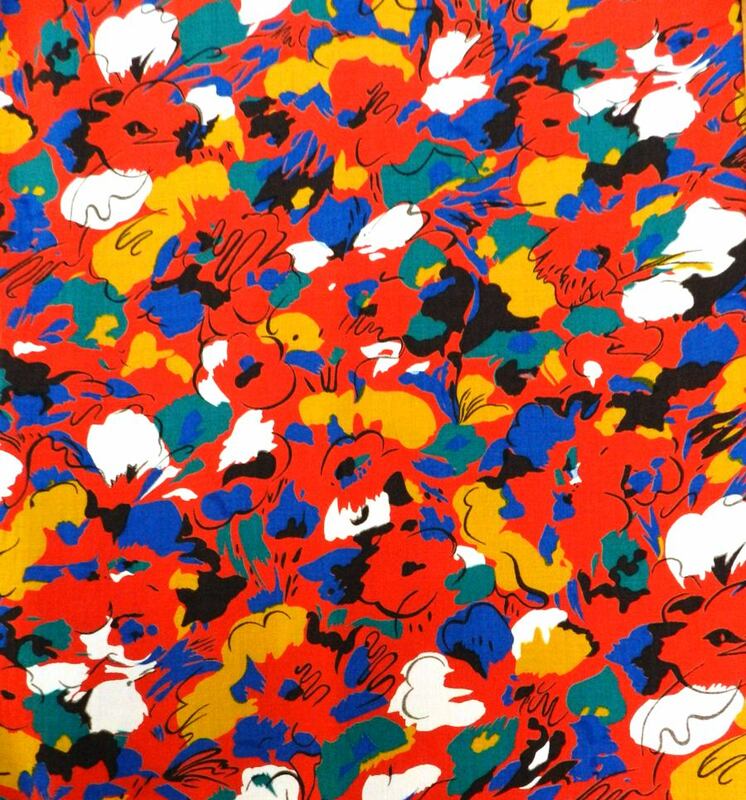 My first – and for several months only – fabric purchase of the year: 200 x 90cm cotton with a floral print. I like the contrast of the pale and bright green roses against the murky background. Visiting thrift stores is one of my biggest hobbies and they are not particularly rare around where we live. Many opportunities to buy pre-owned fabric, one might think. The year, however, started off very slowly. Firstly, the prices at many thrift stores here in Malmö are relatively high. Sometimes the prices are almost at the same level as what one would pay for new fabrics when they are on sale. Of course, from an environmental and ethical point of view this should not matter much, in particular when the profits go to charity. 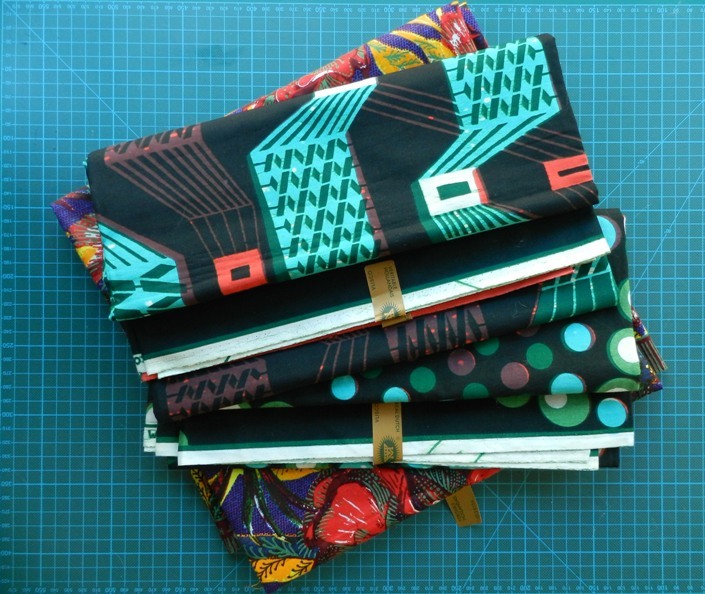 In addition, I think that I get better value for money by buying second-hand fabrics, as they are often of better quality than cheap new fabric and can have more special prints and textures. Two of the three pure wool fabrics I bought this year. The one to the left is 1.5m long, the one to the right 1m. The little card came with the fabric and says Himmelmann & Roos AB Stockholm. The second reason for not buying that much fabric is that I have focussed on what is missing in my stash instead of buying whatever is cheap or looks nice. 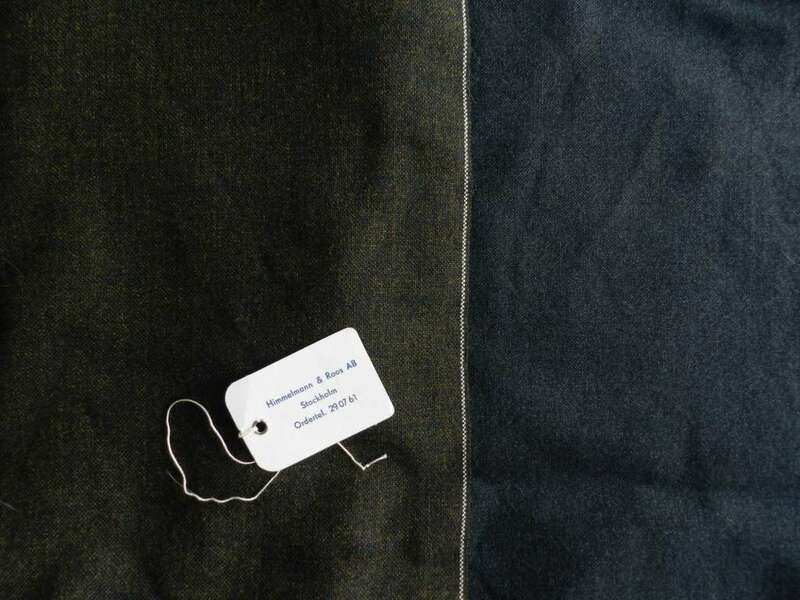 Currently, I am on the lookout for good pants fabrics, which are harder to find second-hand than one might think. 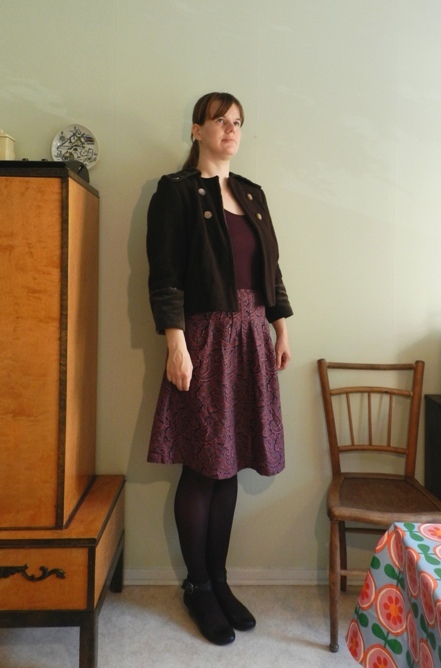 Lately, I have also become interested in flowy styles of the 30s and early 40s, which require drapey fabrics, something in which my stash is lacking. It has also helped to no longer buy small pieces of fabric no matter how cute or special the print is. I love the colours of this 175 x 90cm drapey fabric (probably a cotton blend). I hope to sew this one up soon, because I could really use a flowy summer blouse. The last three pieces of fabrics were auctions at Tradera. The printed cotton seersucker is my most expensive fabric purchase of the year. It cost 125 Sek (c. 13 Euro) (excluding postage). I think I may have had some mental block about spending more than a couple of Euro on second-hand fabric, while I would easily spend a multitude of that on new fabrics. However, I cherish the vintage fabrics in my stash much more. Even if I might never end up using them, I just love going through them, looking at the patterns and feeling their textures. In comparison with, for instance, Etsy, prices at Tradera tend to be very reasonable, by the way. Seersurcker with stylized flowers in my favorite colours against a light blue background. The piece measures 3.5m in length, but only 77cm in width. Still enough for a summer dress, methinks. According to the seller, the seersucker was part of the inventory of a fabric store that closed down a long time ago. Many other unique fabrics were auctioned off at the same time and I still regret not bidding on a beautiful white feather print set against a black background. I did, however, respond fast enough to snap up this paisley print. 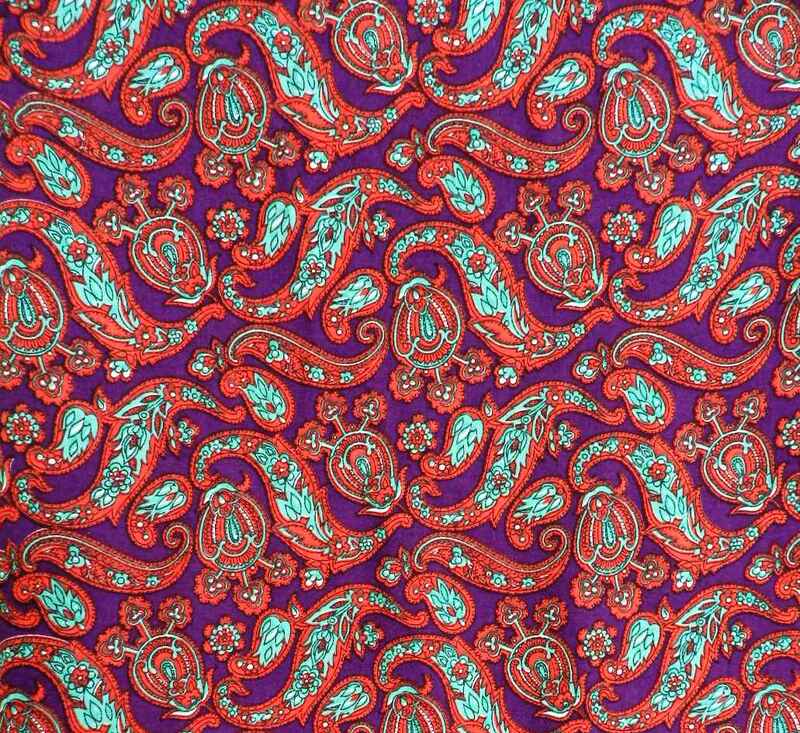 You can never go wrong with paisley, in my opinion. This drapey paisley fabric feels (and smells!) like cotton, possibly with something else mixed in. It measures 280 x 88cm. Not enough for the dress I had in mind, but I am sure I will find another purpose for it. 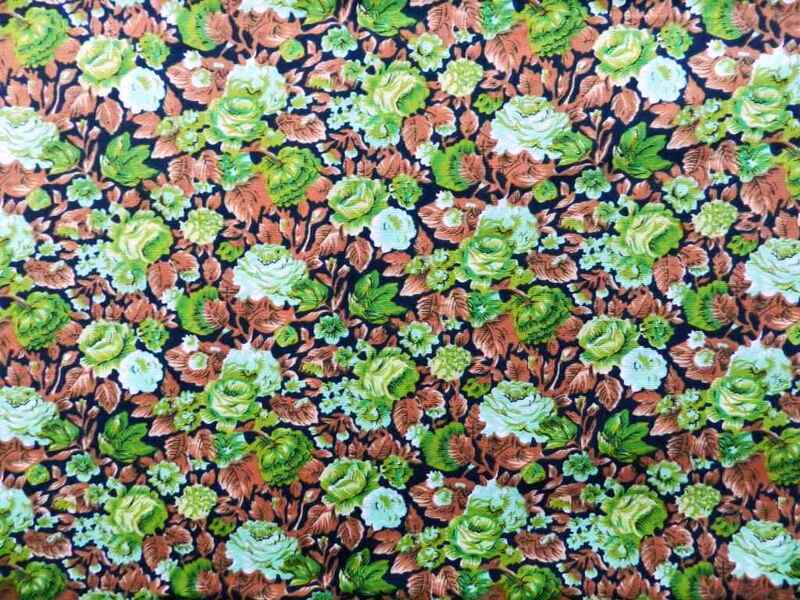 If I would have to pick a favorite, it would be this drapey viscose (rayon) fabric with a fascinating pattern. I am not entirely sure what the print represents, but that is part of its charm. The organic shapes outlined in black remind me of amoebae floating around in water, while the coloured forms could be waterplants and specks of sun reflecting in the water’s surface. The black, round shapes look a bit like fingerprints or tree rings. Such a fun pattern! According to the seller, the fabric dates back to the fifties. 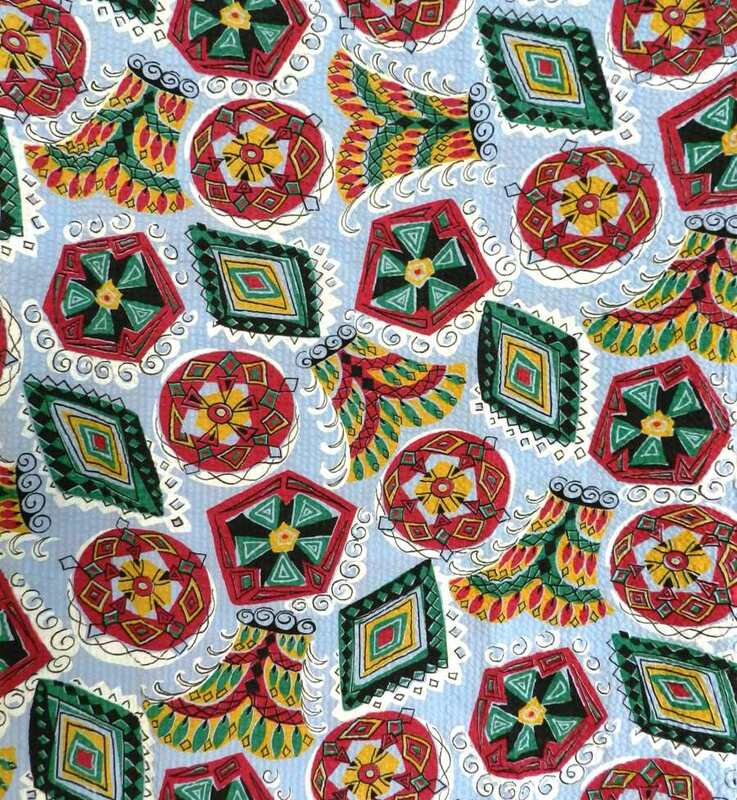 My mum, who was born in 1945 and is the youngest of 9, told me her oldest sisters would wear dresses made out of this type of fabric. 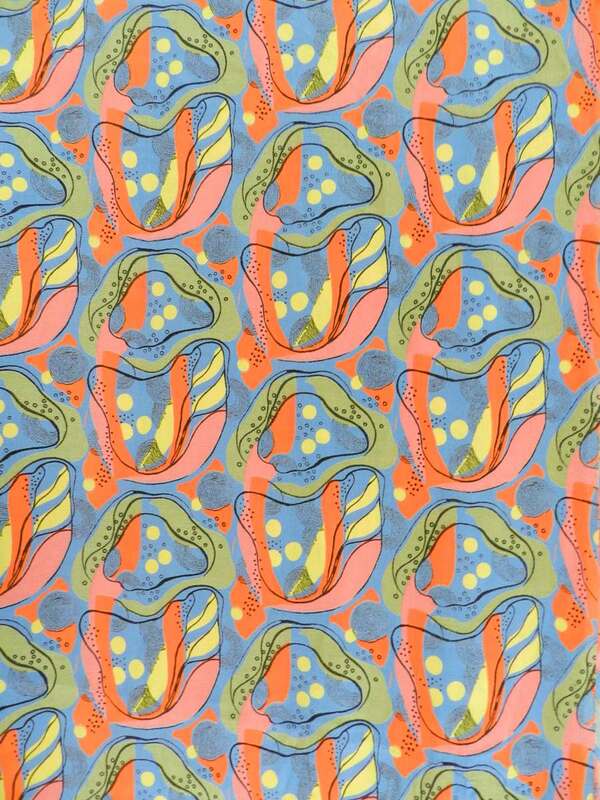 Viscose/rayon with an organic pattern. It measures 410 x c. 75cm. It shrunk a bit in width after washing, becoming more spongy and somewhat elastic. I suppose I could iron it back to its original width, but I quite like it the way it is now. So far, I have bought 10 pieces of fabric in 2016, spending a total of 560 Sek (almost 60 Euro). Not pictured are 3m of black wool gabardine, 2m of viscose lining and 2m of rust-coloured jersey. The last one is the only piece of I regret buying. I did not realize until I came home from the thrift store that there were a couple of big holes along the foldline. I am still very happy with all my other purchases, though, and that was part of the reason for this fabric diet; only buying fabric that I love! I think you did very well with your shopping 🙂 Lots of beauties here! 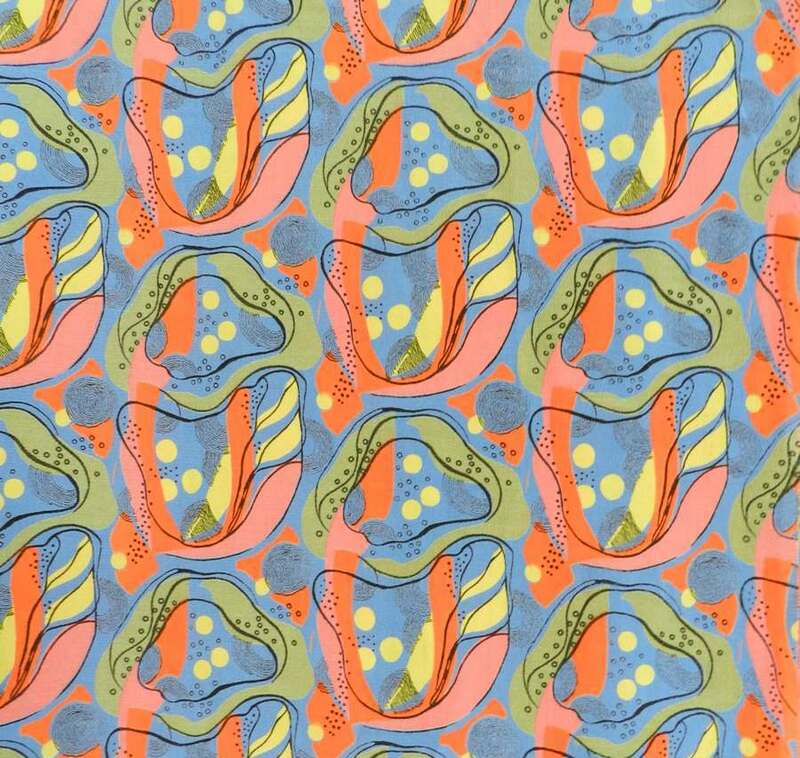 The amoebae print (yes,I see them too)is my favorite, but they are all lovely. I try to be concious about what I want/need when fabric shopping. I wan’t always like that. It truly is an ongoing process. Nice that you buy second hand, too. I wish there were opportunities like that where I live. Sorry for my slow reply, but I was sick most of the week (and almost ordered some fabric online because I felt sorry for myself). Yes, it is an ongoing process and as I was not that aware of what I actually like to work with or wear in the past, I now have some fabrics in my stash that are lovely but in colourways that are totally wrong for me. Sorry to hear that it is difficult to buy second hand where you live, I know from experience it can be hard in certain places.